Digital technology has transformed marketing. One dangerous drawback of the “measure everything” age is the myopic focus on attribution. While marketers once accepted as fact that they didn’t know which half of their ad budget was wasted, today they’ve done a 180 and believe that if it can’t be measured, it’s not worth doing. 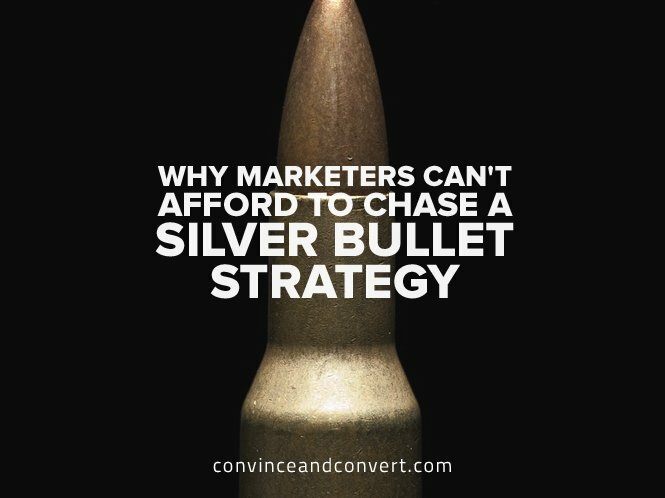 Not only is that mentality flat-out wrong, it breeds an obsession with finding a silver bullet marketing tactic to capture customers. Consequently, you hear some B2B marketers making boneheaded comments like, “we put all our budget on search engine marketing because we get leads.” That’s not something to brag about. Search is certainly vital for converting customers who have expressed their buying intent, but what about all the prospects who haven’t expressed interest yet because they are at an earlier stage of the buying journey, or maybe not even in the market yet? Should we not bother marketing to them? Rather than trying to use a silver bullet, B2B marketers need to take a holistic view of the buyer’s journey and apply the right marketing tactics (plural) to each phase of the journey. If you don’t do anything to drive brand familiarity and interest at the beginning of the journey, then it won’t matter how well you optimize at the end because you won’t be invited into the buyer’s consideration set. After all, the buyers are now self-educating online through the majority of the buying journey before they contact possible vendors. So if they aren’t aware of your offerings then you’re not likely to make it onto their list of possible vendors when they are ready to buy. This is especially true if you sell high dollar, high consideration products or services where the buyer does a lot of research and takes a lot of time to make a decision. On my morning commute, I listen to sports talk radio to find out what I already know: that my favorite teams aren’t as well as they should be. During that long drive, I also hear a lot of commercials for local businesses, even though I’m usually not in the market for what they are offering and tune out the details. But does that mean the ads didn’t work on me just because I didn’t listen to every last detail or write down the phone number? Of course not. As marketers, we know that these types of ads are all about creating brand familiarity, brand recall, and brand preference over time. Local business owners operate in very crowded, competitive markets (think about all the plumbers, car dealers, and restaurants in your city) and know that if they don’t regularly and repeatedly capture mindshare of consumers, then they’ll start losing more and more of them to competitors. Unfortunately, many of my B2B marketing colleagues haven’t learned this lesson and skip brand marketing altogether, thereby missing the opportunity to engage all potential customers, not just the ones who are ready to buy at that minute. One of the ads I hear every day is for a local plumber. It’s a catchy spot. Of course, I don’t need a plumber everyday. In fact, I haven’t hired a plumber in more than a decade. But then one day the need arose when my water heater quit, so I did what anyone else would—I Googled plumbers in my area. A lot of marketers would say that my journey began at that moment, but I’d argue that my journey began years ago when I first heard the ad because that was the moment I associated this particular brand with plumbing services in my area. Naturally, Google gave me a lot of relevant results, but guess which one I clicked on? The brand I was most familiar with—the one that had been talking to me about plumbing since before I needed a plumber. My point isn’t that every B2B marketer should start using radio ads, but rather that by creating a strong brand identity in the marketplace, you’re giving yourself a head start on engagement throughout the rest of the buyer’s journey. If my plumber only invested in marketing that they could measure, then they would stop advertising on the radio, and I probably wouldn’t have clicked on their search ad. For decades, the best marketing strategy has been to combine brand advertising and intent advertising for maximum return. Back in the day, it was magazine ads plus yellow page ads, and today it’s digital display ads plus search engine ads. According to several recent research studies, B2B buyers complete over 60 percent of the buying journey before contacting vendors to get a proposal from a sales rep. That means that today’s customers aren’t relying on your sales team to educate them and steer them toward your product, as they did in the past. But that doesn’t mean B2B marketers have lost the opportunity to educate potential buyers; in fact, content marketing gives B2B marketers several great ways to engage buyers during the research phase. Unfortunately, only about 30 percent of B2B marketers say their organizations are effective at content marketing. Is the problem that B2B marketers don’t have podcasts? Nope, there’s that silver bullet mentality again—”If only we had a podcast, customers would be beating down our door.” No one medium is better than another for engaging B2B buyers with content marketing. Some industries favor podcasts, but some companies do better with whitepapers or blogs. What works with one audience won’t necessarily work with another. You have to experiment, and you have to give value to get value. Content marketing isn’t about selling prospects on your products. It’s about helping buyers locate valuable information while they’re in the research phase—or better yet, helping them self-educate about solutions to their key challenges. So if your content marketing reminds you of your sales materials, it’s a good bet that you need to make a change—fast. Still, the middle of the B2B buyer’s journey isn’t exclusively about content. Trade events and trade publications represent two proven channels for engaging buyers. But it’s no longer enough for B2B marketers to place an ad in a monthly print publication or appear once a year at a trade show, since those engagements with prospects are few and far between. Instead, B2B marketers need to focus on digital tools that work 365 days a year. Why not use digital advertising to promote your ebook or video on a major challenge in your industry? That way, you broaden the audience for your educational content to the people who can use it most. Programmatic advertising is a perfect tool in that regard, since it identifies and targets people who have shown interest in your solutions by reading articles or researching topics online that are related your industry, your business, or even your competitors. For most organizations, analytics play a bigger role the further you go down the buyer’s journey. Many B2B marketers (especially the ones who only spend on search engine marketing) focus solely on lead conversions. But there’s actually a much larger and more important lesson here. Sure, on a small scale, you want metrics that help you identify and make sales. But on a larger scale, analytics help you understand how well you are doing at each phase of the buyer’s journey. How well are you building awareness of your solutions with your target audience of buyers/influencers? The answer relies on the analytics that track ad impressions, website visits, social account views, search clicks, branded searches, and so on. Which companies are visiting your website? And what percentage are on your target account list? How many RFPs do you get per month or quarter? And are you seeing an increase or decrease over the previous period? How do customers feel about your company? Are online reviews positive or negative? More importantly, can you use those reviews to spotlight systemic issues with your product, or exploit larger market opportunities? Embrace analytics to answer the above questions, and you’ll have the power to transform an organization from one that is fixated on a single performance metric to a more holistic enterprise. Not only can you refine your marketing tactics and adjust your messaging to specific buyer types, you can make data-driven decisions about how you allocate resources. By connecting each aspect of your marketing to the larger whole, you’ll gain deeper, more actionable insights into each customer’s journey, as well as a better understanding of how you can engage throughout each phase of that complex process. That kind of transformation is much more challenging than looking for a silver bullet, but unlike a silver bullet, a holistic approach is incredibly effective—and the analytics can prove it. Todd serves as Chief Marketing Officer for MultiView, overseeing brand, product marketing, demand generation, online marketing, sales enablement and communications. As a seasoned B2B marketing veteran, he brings more than 20 years of experience at technology startups and Fortune 100 enterprises. Before coming to MultiView, Todd was also CMO at ReachLocal, where he helped the company grow into a publicly-traded leader in online marketing for local businesses across search engine, display, social and mobile marketing.